Junk Unjunk! : Batting Gloves Re-palmed! Early in my cricket career, I did not have my own pair of batting gloves but used the ones from our club kit. They were not in good condition and our club could not afford to keep good ones either. It was in the early 1980s. Looking back, I shudder to think about how in our youthful exuberance courageously faced good fast bowlers who operated with the hard, new cricket ball up the batting order with very poor physical protection. In 1982, my friend Girish Nikam had given me his batting gloves as he did not need them anymore. 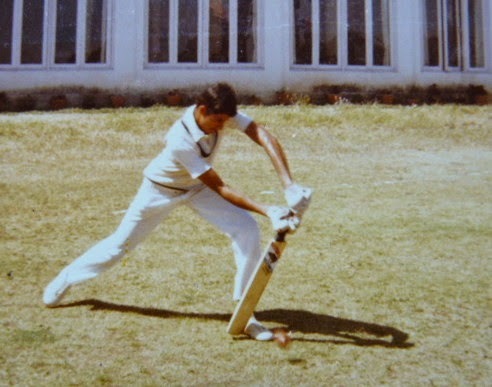 I was batting in the top order at that time. It was only a slightly better pair than the ones in our team kit. I was using it in a match and to my bad luck, the ball rose suddenly and broke the ring finger. It happened at a crucial time that put me out of action for 6-7 weeks and cut short a season that had begun well. With it I had to miss out on the Under-25 Mysore Zone, a crucial tournament that is often a launchpad for talent to go higher. Just by coincidence, the accident happened on the same day when Hindi film actor Amitabh Bachchan also sustained a serious injury while shooting for the film 'Coolie'. I continued to use Girish's gloves as he had by then stopped playing active cricket. This picture is taken at Poona in 1986 and I think I am wearing those at pre-match practice My confidence had regained to some extent, post-fracture. Around 86-87, I happened to notice a pair of junked gloves under the spiral staircase in our club secretary's house where all our club/team's cricket paraphernalia used to be kept. The pair was of good quality leather, having good padding on the fingers and thumb. It had been discarded because its leather palms had been badly tattered and worn out. It was the personal pair of one of my team mates, David Purushottam. Our club secretary agreed to my request to take them. I had heard of batting gloves being 're-palmed' at some cost. Why not I repair the pair myself? What you see this picture is the third re-palming [cotton cloth] I had made. The pieces were hand sewn on to the gloves. They used to last well and helped me play with comfort and confidence. I later added an extra piece of hard foam to the first two fingers of the right hand, a spot susceptible for taking blows. This came in handy a few times as it took a few blows and absorbed the impacts very well and saved me from injury. You know, the cricket ball is very hard and approaches batters at great speed. The repaired-pair had become more popular than my self-stitched caps I wore for the matches! I stopped using them after I got a top-class pair from another team mate J.Srinath, who went on to play for the country. I'm still using them 14-15 years since I got them, though I bat lower in the order, but protection is a must anywhere. A helmet is another need these days and I want to do something what Mike Brearley of England or our Sunil Gavaskar did in designing their own skull protection caps, some day. I was not alone in doing such things! 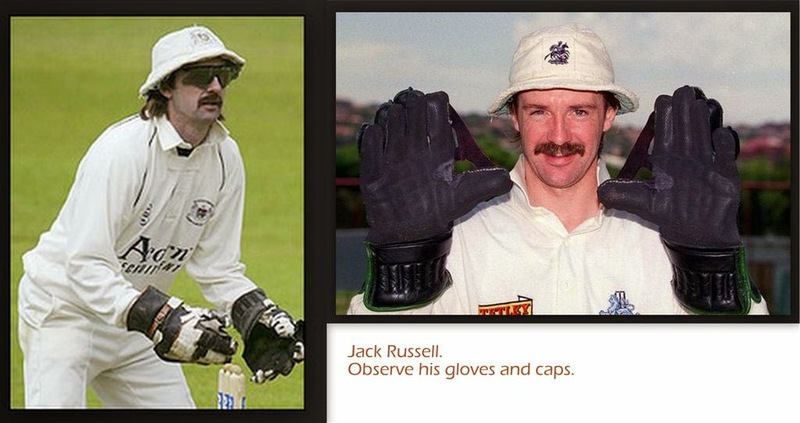 I came to know that Jack Russell, one of the best wicket-keepers of England, used to repair his wicket-keeping gloves himself. But then I was already doing that - I had stitched a crude pair of cotton wicket-keeping gloves just for kicks before I played any real cricket in the mid 70s! Russell's love for his cap and his painting talent is legendary. I wish we had met!! Dinu! I have been reading your recent blogs, now that you prompted with a link. While even to read an interesting thing which I like to do, I need 'spoon-feeding', you have really been so resourceful - in unjunking Broken pots, Mirrors with Meccano-clamps, Scissors & Trowels, Paint-Buckets, Gloves etc. Keep up the Good Work. I really wish you were my SON!! Vintage photos 'unframed and 'albumed'!